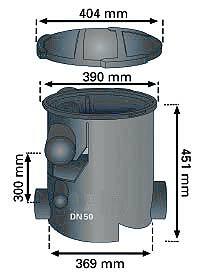 Rainwater filter for bigger roof areas to 450 m2. Self cleaning, low maintenance intervals with an easily removed filter for cleaning.This model has a side outlet. Reduce wasting water when collecting higher volumes of water for big tanks. High level filtering efficiency independent of flow rate with continuous filtering of dirt particles. The filter is frost resistant. The structure of the stainless steel sieve lets dirt wash directly into drainage system so is self-cleaning. The filter easily removed for cleaning making the 1000595 a very low maintenance model. Materials: PE and stainless steel. Stainless steel sieve with a mesh size : 0.55 mm. Height difference between inlet and outlet : 300 mm.